John Paoletti, the Kenan Professor of the Humanities, emeritus and professor of art history, emeritus is the author of Michelangelo’s David: Florentine History and Civic Identity, published by Cambridge University Press, Feb. 2015. Paoletti was on the faculty at Wesleyan from 1972 to 2009. 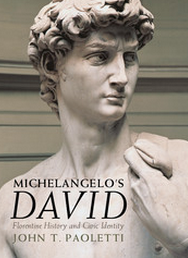 According to the publisher, this book takes a new look at the interpretations of, and the historical information surrounding, Michelangelo’s David. New documentary materials discovered by Rolf Bagemihl add to the early history of the stone block that became the David and provide an identity for the painted terracotta colossus that stood on the cathedral buttresses for which Michelangelo’s statue was to be a companion. The David, with its placement at the Palazzo della Signoria, was deeply implicated in the civic history of Florence, where public nakedness played a ritual role in the military and in the political lives of its people. This book, then, places the David not only within the artistic history of Florence and its monuments but also within the popular culture of the period as well. Paoletti taught the history of Italian Renaissance art and of the art of the 20th century from 1972 to 2009. He received the Binswanger Prize for Excellence in Teaching at Wesleyan in 1997 and the Distinguished Teaching of Art History Award from the College Art Association in 2003. He is an expert on art of the Italian Renaissance in Europe and the United States after 1945.